Our time here in Torino is nearly up, just one more week until we return to the U.S for a little bit and I can’t wait to share some our vegan Italian deliciousness on the blog. I’m going to miss Torino, it has been one of the most comfortable cities we’ve visited in Europe and up there with Valencia, Spain as one of our favorite destinations for an extended stay. The delicious simplicity of authentic Italian food is irresistible! And since we’re in Italy, we’ve lined up a lovely Italian guest blogger today – Daniela from Food Recipes HQ. Daniela is originally from Napoli, but is currently based in London. She’s a vegetarian and her dishes only use natural and organic foods that are untreated and free from preservatives, colorants or additives. Being brought up in Southern Italy, she was raised with the belief is that food should be made fresh and home-made as much as possible – and I absolutely love that! Along with Italian cuisine, Daniela also enjoys experimenting with exotic recipes and is currently learning Japanese, isn’t that awesome? Hi all, I’m Daniela, an Italian girl very happy to guest post for Rika today! I’m also a scientist and I am a vegetarian in London. I do not eat meat, fish and even chicken, the most consumed type of meat here in England, the country where I live. Have I already told you I am Italian? I was born in Napoli, where I was raised with buffalo mozzarella and pizza. Well, perhaps mozzarella is the reason why I am not vegan yet. I do not consume cheese very often anymore and to tell it all I am really determined to avoid it. Cheese is high in saturated fat and it doesn’t do well to my body. Too bad that milk and cheese are so rooted in our eating habits, so much rooted that very few actually know that milk is not intended for human consumption. Many claim that it contains a precious of calcium. Let me debunk this myth in a line: there is as much or more calcium in 4 ounces of firm tofu or in a cup of collard greens as there is in one cup of cow’s milk. We can find excellent sources of calcium in other foods. What about dark leafy green vegetables and legumes? Another great option is tofu, which is obtained by coagulating soy milk with calcium sulfate; tofu made with calcium sulfate is very rich in this mineral, containing 350 mg of calcium every 100 g of product. 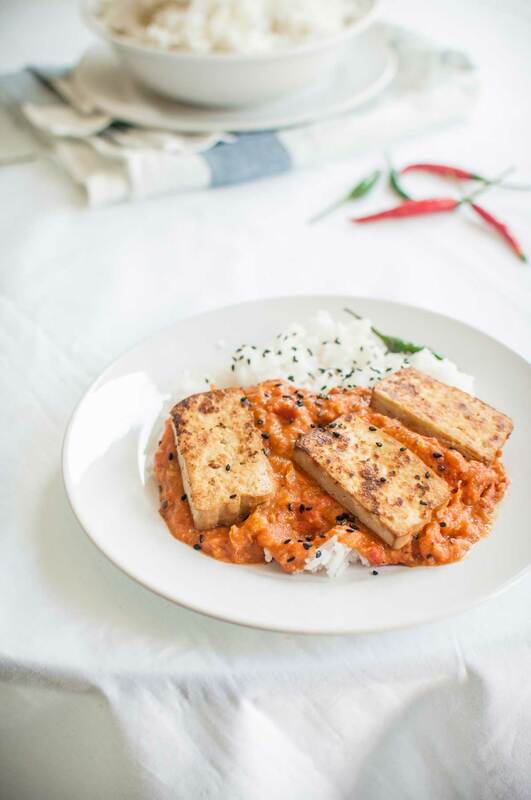 So while Rika and Doni explore my homeland indulging in pasta dishes which I assume abundant and rich in Mediterranean flavours, I explore the oriental cuisine venturing with a rich and flavourful curry that features tofu as a main source of protein. In this dish you will also find simple and useful carbohydrates from the basmati rice and a discrete amount of good fats from coconut milk; these fats, known as lauric acid, are very good for us since they are converted in the body into a highly beneficial compound called monolaurin which offers with great antiviral and antibacterial properties. Soon after I moved to London more than 4 years ago, I started working in an Indian restaurant. I just wanted to practise my English and I thought that a working experience in the catering sector could help me improve my poor communication skills (at that time I could just correctly say Hello and mispronounce a plethora of other words). I ended up fulfilling duties that do not require the use of any language, such as drying dishes or keeping the buffet tidy and clean. OK, this is another story. The reason why I’m mentioning it now is because back then I fell in love with Indian cuisine. I clearly remember the intense flavour of the fragrant curry I was serving the customers (ehm… no, it was served by other waitresses since I was not allowed to approach people but only dishes, sigh), the aroma that could not leave my clothes and the creaminess of a spicy sauce that I had never tried before in Italy. I never got tired of eating curry during the time I worked in that restaurant in Russel Square. Could you survive by eating a spicy curry every day? Now I know I can. I recently ran into Rick Stein, a very famous British chef who travelled to India in search of the best Indian curry. No, I haven’t met the chef personally. I’ve just got hooked on his cookery/travel programme broadcasted by the BBC not long ago. His recipes are rarely vegetarian however his passion for the bold flavours of Indian cuisine struck me and inspired me. Here’s a curry born from this source of inspiration, simple and not too time-consuming. It is extremely easy, far more than I could imagine (if you check my blog you will realize I am very much into easy recipes made with a few but fresh ingredients). Before I say goodbye and leave you to the recipe, let me share my secret to making a great curry. Are you ready? Just use seeds instead of a ready-made garam masala blend. For this recipe I toasted whole cumin, fenugreek and coriander seeds until they crackled then I grinded and blended them together with garlic cloves and ginger. The aromatic spices contributed to the taste wonderfully. Tofu is tofu, I don’t need to introduce it to you, I guess. Let me just say it is not as tasty as mozzarella to me (OK, I’m being too “Italian” now). Luckily, mozzarella does not fit in a curry dish. The sauce here stands out so well that the addition of any other ingredient would probably spoil the dish. Enjoy it! Buon appetito! Dry fry all the seeds and pods until toasted. Place in a blender together with ginger, garlic and little water. Blend until a paste is formed then set aside. Lightly fry the tofu slices in olive oil, set aside. Gently fry the onions in a pan. When golden add the ginger, garlic, and chillies. Now add the curry paste and the tomatoes. Cook for ½ hour on hob, or in the oven at 200C/320F/Gas. You want a thick consistency but don’t let the curry dry out too much; consequently add the coconut milk during the last ten minutes in order to achieve your desired consistency and flavour. Stir in tofu and heat through. 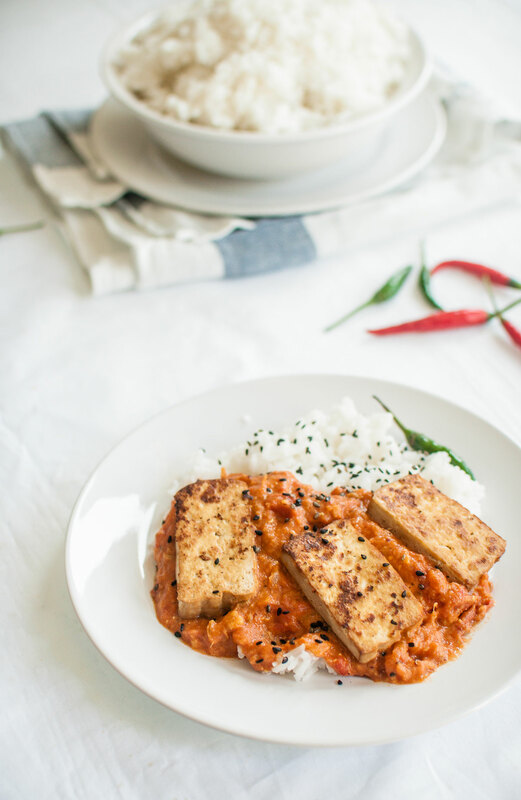 Place tofu slices on the sauce and serve with cooked basmati rice. Learn more about Daniela here. Connect with FoodRecipes HQ at her Website + Facebook.